Record Nations works to find the most appropriate document scanning service that will work best with your company. Besides the management system itself, making sure the scanning process fits your business’ schedule with little interruption is a vital piece to choosing the right provider. It is important for some companies to have their scanning projects done onsite due to privacy laws and regulations and other compliance rules. If you have the need to see everything being scanned and also need to make sure that none of your records leave your office, we can make sure to complete the scanning at your location. If you don’t mind having your records sent to an off site facility to complete your scanning project, we can also take your paperwork to our facility and perform the scanning there. Typically, when a business chooses to go paperless and is looking into the best ways to handle their project, the first step is to look into your company policies and industry practices. It can actually be easier to have someone come to your location which reduces the risk of missing or losing some of your files. Some industries require that all document scanning be done onsite with a qualified witness throughout the process. Although this may increase the time the project takes to complete, it is a good way to ensure the quality control and security of the scanning service. On the other hand, an off site scanning service can be done more efficiently. Conversely, this option doesn’t allow for someone to constantly monitor the scanning process. Whichever way your business decides to scan, Record Nations and our local professionals can accommodate all your specified needs. What kind of scanning project are you looking into? 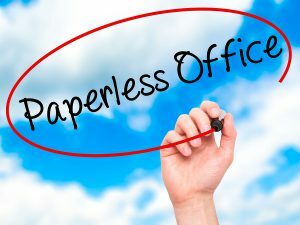 Is your office planning on going paperless, or are you just scanning certain files into your system for backup? How will you manage your records once they are scanned? How will you handle your documents after they are scanned? We offer destruction or storage options as well. Are there any company policies or industry requirements that will affect the scanning process? Get Free, No Hassle Quotes on Onsite or Offsite Document Scanning Today! Whether you decide to have your scanning project done at your location or off site, your project will be completed in the most efficient fashion. To get free quotes in just minutes, fill out the form to the right, or give us a call at (866) 385-3706. Our experts are ready and waiting to help find the right solution for your business!